The Curious Wavefunction: Friday levity: 'Nature' discusses ghosts. One of the pleasures of thumbing through old issues of science journals is the opportunity to accidentally discover articles or letters that make you do double takes, often followed by face palms. 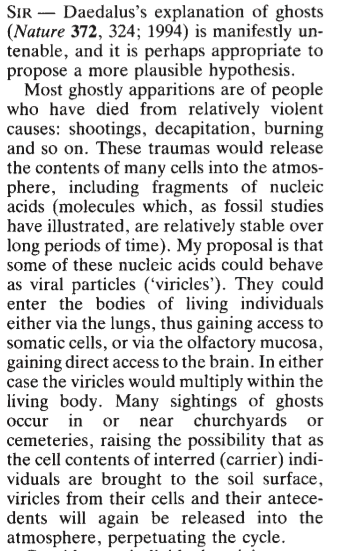 As I was about to read a letter in Nature bemoaning the closure of the Hoffmann-La Roche Institute of Molecular Biology in Nutley, NJ (Nature, 1995, 373, 184; deja vu, anyone?) I came across a letter on the same page that pristinely tosses out the following for readers' benefit (click for clarity...or the lack thereof). 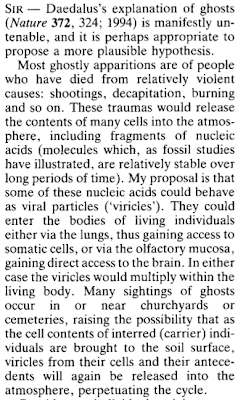 I love the fact that the letter writer dismisses one hypothesis about ghosts only to come up with another. And this isn't 1885, it's 1995. Oh how I miss the old Nature. I wonder why the editors decided to publish it? Whimsy? Likely. What I love is that there's actually an attempt at providing a rational explanation. This goes back to my post about scientific publishing becoming too conservative (and as this example indicates, less humorous).